Keeping track of your expenses or your time spent on a project is a valuable resource for many, such as freelancers and small business owners. The epiPhoné Coders' Guild provides a pair of useful applications for those who like to have that information at their fingertips: iSpend and PocketPunchlock. 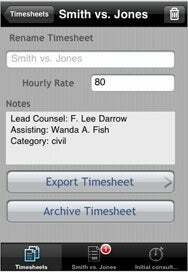 The latest version of both applications also add the ability to export your data to Google Docs or Google Spreadsheets. iSpend allows you to track expenses on your iPhone. Multiple “jobs” allow you to keep your expenses separate for different clients or purposes and you can also categorize expenses based on type, such as travel, lodging, food, etc. Additional features include the ability to take pictures of a receipt and store it with the record, and the ability to track billable miles. Exporting to Google Docs or Spreadsheets requires you to have a free Google account, but you can also email your expenses to yourself in comma-separated value (CSV) format. PocketPunchclock helps you track how much time you’re spending on projects, whether for personal or business reasons. The application takes advantage of the iPhone’s location services to track where you are when you clock your hours—it can store longitude and latitude along with the time and date. For those who track hours for multiple clients, PocketPunchclock allows you to store several timesheets, each one containing a list of tasks. As with iSpend, data can be exported from PocketPunchclock either by emailing it in CSV format or by sending it to Google Docs or Google Spreadsheets. Both iSpend and PocketPunchclock are available on the App Store and are compatible with iPhones and iPod touches running iPhone software 2.0 or later. iSpend costs $11 and PocketPunchclock costs $10.